“How can we grow old being valued and respected?” asks David Slater, artistic director of participatory arts company Entelechy Arts. In a country with an ageing population, this is an issue that is set to become ever more urgent. Home Sweet Home, the new community project that Entelechy has produced in collaboration with Freedom Studios, hopes to begin answering just that question. It takes an honest look at the realities of getting old, discarding media stereotypes and talking to older people themselves about the experience of ageing. “We wanted to find out about what the experience of being older in contemporary Britain is and how we might interpret that as artists,” explains Deborah Dickinson, creative producer at Freedom Studios in Bradford. 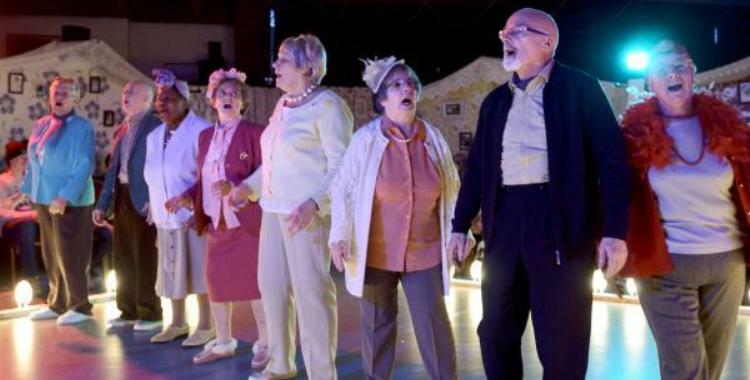 The company had previous experience of participatory work from 2011 production The Mill – City of Dreams, but turned to Deptford-based Entelechy Arts for their expertise in working with older people. While a show was always the intended end point of this partnership, process was just as important as product. Over two years, both organisations ran workshops and interviews with older people from their respective cities. It was also vital that writer Emma Adams and director Tom Wright were involved throughout the journey, allowing them to draw from the experiences being gathered. “They were absolutely critical in informing the way that we made the piece of work,” Dickinson says of the project’s many participants. “You always end up compromising to a certain extent, but those people’s voices are very much there in the writing.” With work of this nature, there is a question around who really has ownership over the material. Slater admits that “it’s a delicate line to tread,” but one that he believes Home Sweet Home has succeeded in doing. The research, which included speaking to academics at Newcastle University and Kings College, London, has also turned up surprises. While many of us think of ageing as an inevitable process, scientists now believe that there is no prescribed way of getting older and that social interaction plays a considerable role in our experience of ageing. “If we see everybody as a potential agent of change and capable of contributing to society right to the end, then people can carry on being just that for much longer,” explains Wright, adding that the production’s chorus of older community performers are an onstage demonstration of this capability. The show that has emerged from this two-year process of research and development is designed with older people in mind at every level. As well giving voice to older characters, its staging is intended to be as welcoming and accessible as possible to audiences of all ages. Wright describes it as “a cross between somebody’s living room and the theatre”. Home Sweet Home will now be performed in both Bradford and Deptford, as well as at ARC in Stockton, which also has an impressive record for including older people in the life of its building. As pensioners make up more and more of the population, this will increasingly become a key consideration for arts centres across the UK. “The Arts Council has said that they want great art for everyone and I don’t think there is enough work done for the everyone,” suggests Dickinson, referring to both older people and other groups who often feel excluded from theatres. Wright agrees that theatres and arts centres “should be a place for the whole community to come and meet”.